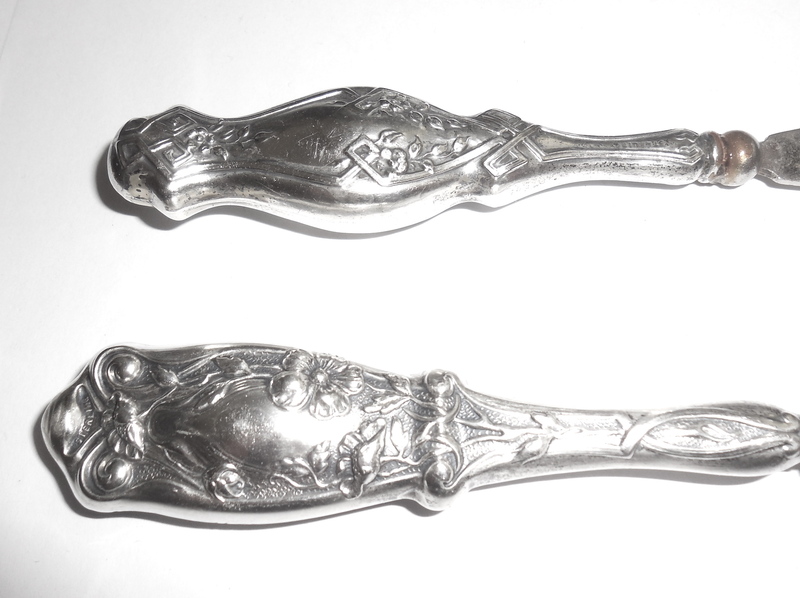 Antique Victorian Sterling Silver Boot Shoehorn Parts Group 2 – This is a group of 2 antique Victorian long handled large and extra large sterling silver boot shoehorns in “as is” condition and “for parts only”. One handle is marked sterling and the mark on the other has worn off with age. Both have age wear. 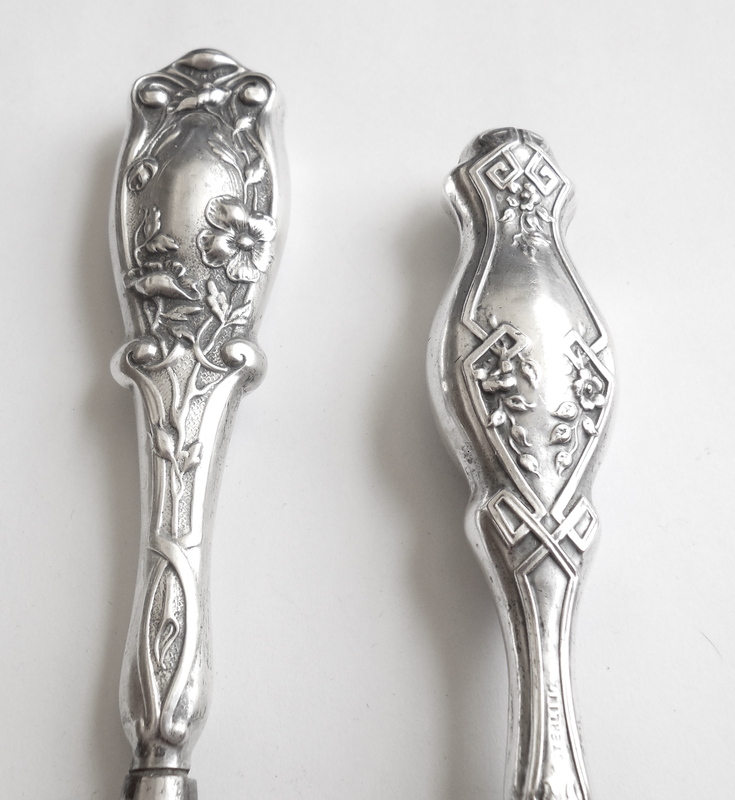 Both are tested and Guaranteed to be original, Victorian hollow handled sterling silver……Not plated. The horns on both are extremely worn and pitted and will need to be replaced OR the handles can be repurposed for other items like flatware, magnifier, tools etc…Size of the larger shoehorn is 9″ and the shorter shoehorn is 8 3/16″. They are from an antique Victorian estate group and were never monogrammed. Nice early items for anyone who can replace the horns or repurpose them. 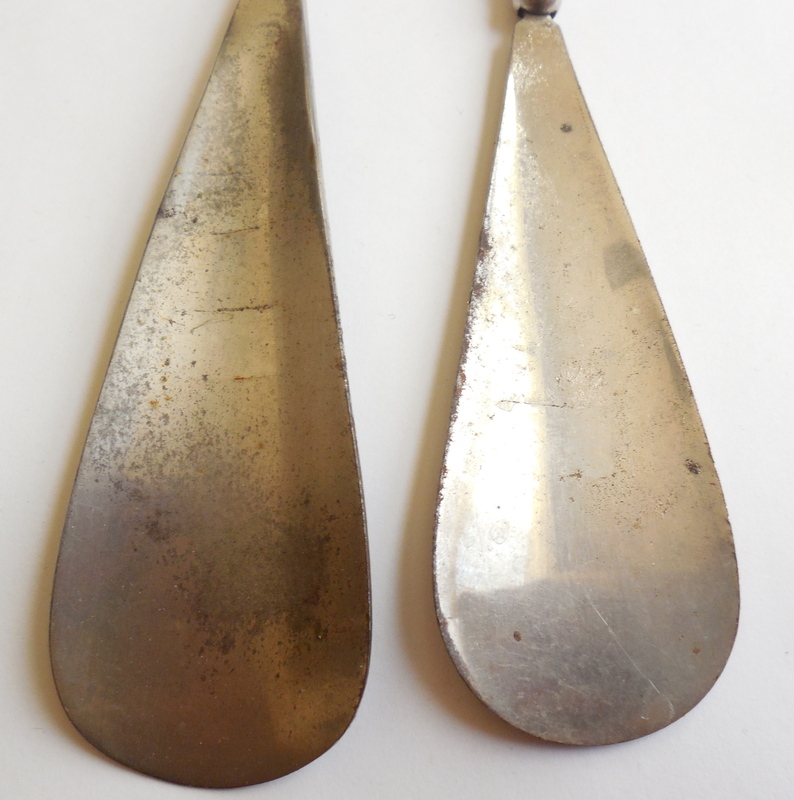 Antique Victorian Sterling Silver Boot Shoehorn Parts Group 2 – This is a group of 2 antique Victorian long handled large and extra large sterling silver boot shoehorns in “as is” condition. One handle is marked sterling and the mark on the other has worn off with age. Both have age wear. 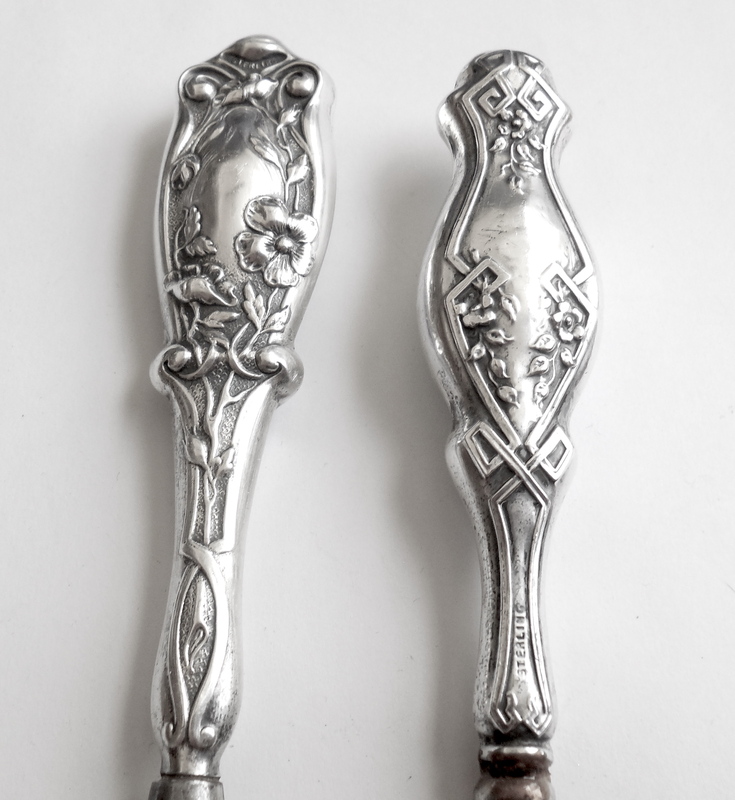 Both are tested and Guaranteed to be original, Victorian hollow handled sterling silver……Not plated. The horns on both are extremely worn and pitted and will need to be replaced OR the handles can be repurposed for other items like flatware, magnifier, tools etc…Size of the larger shoehorn is 9″ and the shorter shoehorn is 8 3/16″. They are from an antique Victorian estate group and were never monogrammed. Nice early items for anyone who can replace the horns or repurpose them. Vintage Sterling Silver Flatware Cream Sauce Ladle Dipper - This is a lovely late Art Deco to Mid Century sterling silver sauce dipper ladle server with a fancy cartouche that was never monogrammed or inscribed. 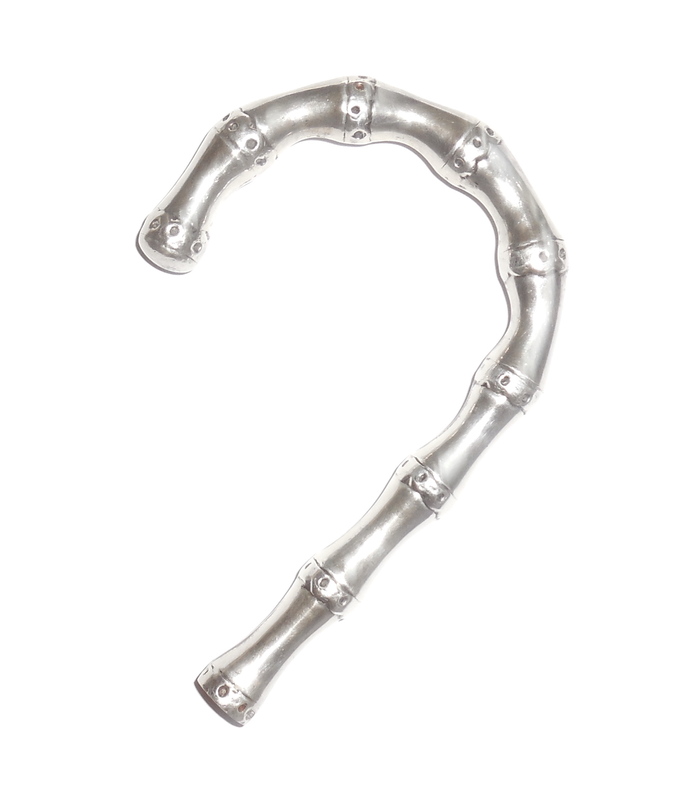 It is marked sterling and Guaranteed to be solid sterling silver. Size is 5 1/2" long and the bowl is 1 9/16" across in diameter. There are age wear scratches that can be professionally polished out. Other than this it is in excellent overall condition. No dents or dings. No deep scratches, tears, gauges, etc...No bends. Just light surface general age wear. It also has a well made bowl that is 5/16" deep so it holds the sauce easily. A lovely serving piece with a nice length handle for your formal dining table. 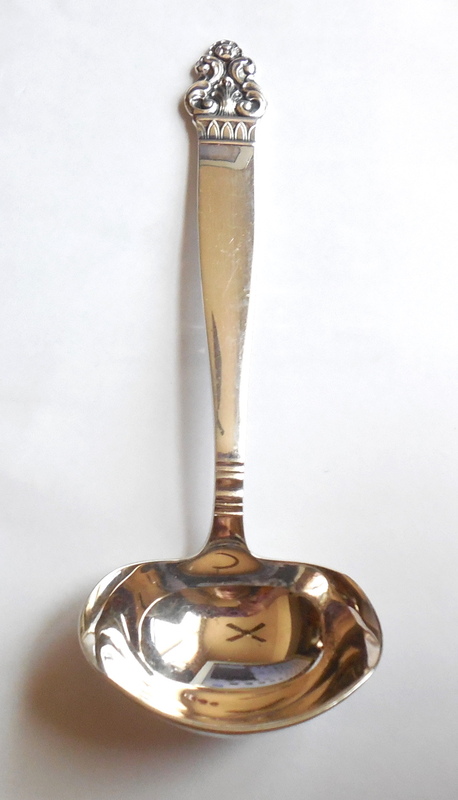 TH Marthinsen Norway 1967 Vidar Gravy Ladle Server Dipper Silverplate in beautiful, bright, crisp clean condition. Never monogrammed or inscribed. Larger than the cream sauce ladle in this pattern, this is a gravy ladle and measures 6 3/4" tall with a 2.25" wide deep bowl. The pattern has a lovely 1660s mid century modern design. 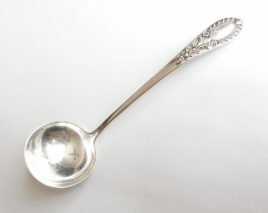 Sure to enhance any formal dining table this is an aesthetically pleasing and very well made ladle for your vintage silver flatware display. 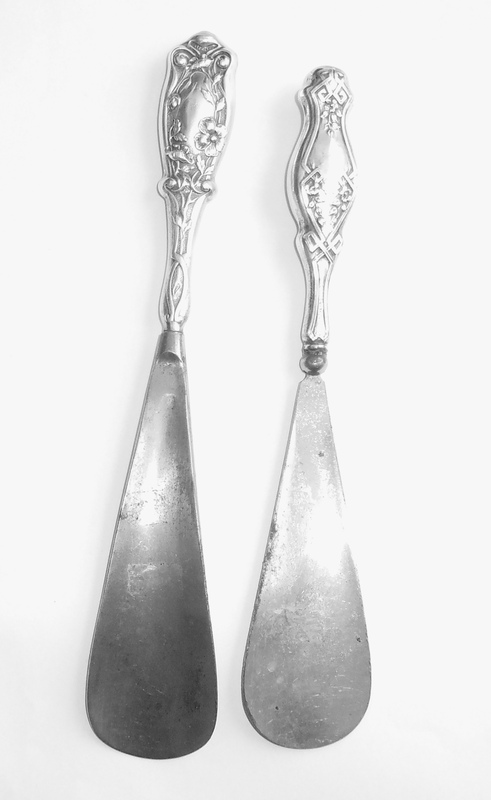 Art Deco R Wallace Sterling Silver Tongs Sugar Candy Bon Bon - This is an Art Deco Wallace Silversmiths sterling silver sugar tongs with 5 graduated tines on the tips. They have a fancy script BF monogram and are extremely strong, solid, sturdy and very well made having R Wallace hallmarks, sterling and Guaranteed to be solid sterling silver. They are thick and don't bend easily so they will retain their form without denting. They also have a good spring back which is an indicator of higher quality silversmithing. Size is 3 1/4" long. 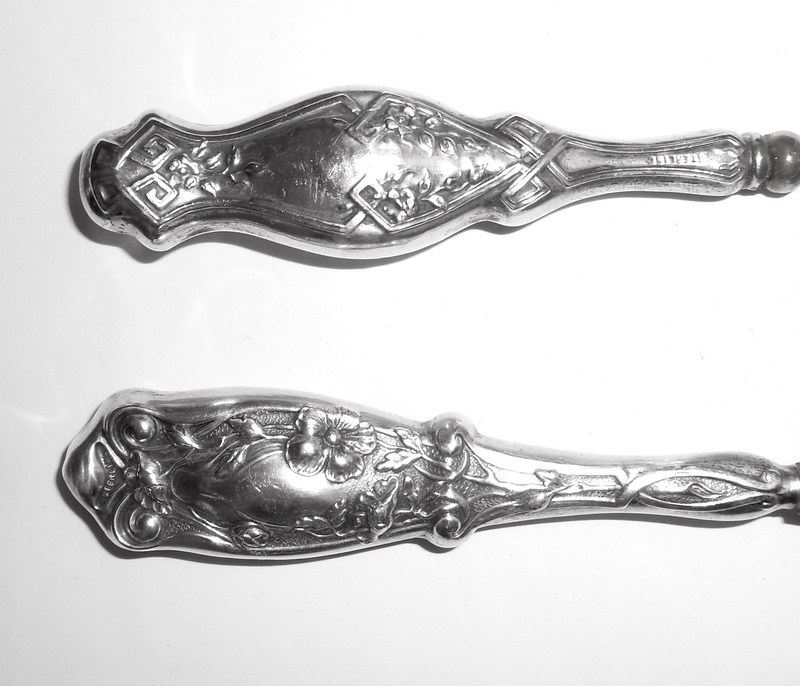 This size tong is commonly used as a server for sugar, delicate foods like hors d'ouevres, cookies, candies, bon bon, light pastries or other fine light foods. Width across the clawed tip is 5/8" across. Width across the handle is almost 1/2" at the top tapering down to 1/8" at the bottom. Condition is excellent, original, No damage or repair. Never altered or modified. No dents or dings. No tears. 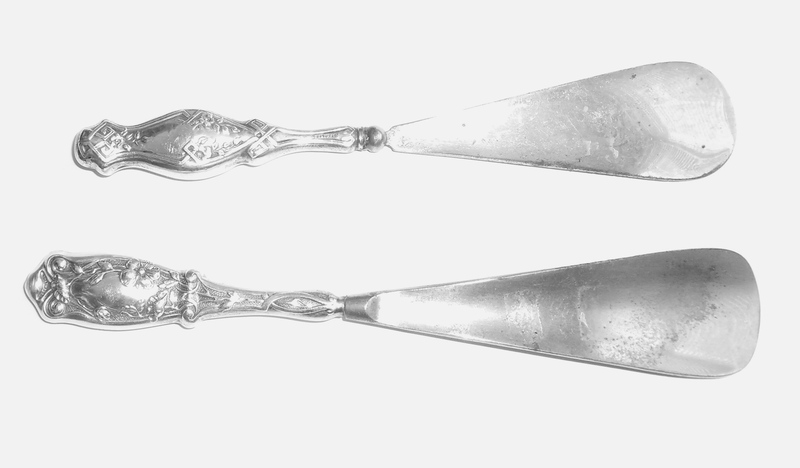 Having beautiful older vintage hammered 1930 Art Deco geometric design and being of better quality by a known maker these are lovely sterling silver serving tongs for your formal dining or luncheon table. Antique European 800 Silver cane walking stick parasol handle in completely original, excellent condition. It was made during the late Victorian to Early Edwardian Turn of The Century Era1880s to 1910 and has a nice chunky Victorian dogbone look. It is marked 800 with what looks like a lobster or crab hallmark and is also tested and Guaranteed to be solid 800 silver.....Not plated. Size is 5" tall north to south by 3 1/2" wide east to west. 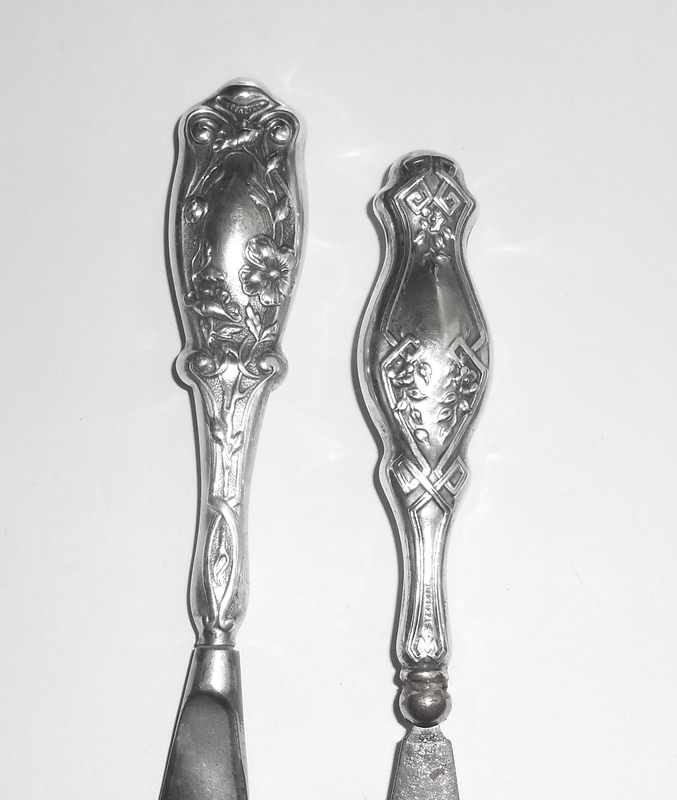 The silver is 5/8" wide in diameter at the top around the curve tapering down to 1/2" in diameter at the bottom where the parasol or cane would be attached. The inside still contains the original piece of drilled out wood in order to properly connect a cane, walking stick or parasol. Weight is 41.1 grams. Overall condition is excellent. Never monogrammed or inscribed. No modifications or alterations of any kind. Original as made by the original silversmith. Made by hand as seen in seams and joints. No dents or splits or tears. Cleaned but not jeweler polished out. This is a lovely antique 800 silver handle for your collection or add to an early parasol or walking stick. It will look beautiful!